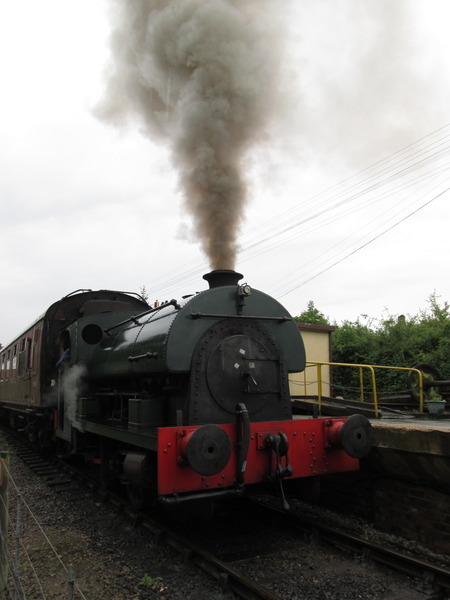 For the Bank Holiday Weekend – the annual camping rally at Beaumanor Hall in Leicestershire – I travelled by train on Friday from Market Harborough to Loughborough. After the thirty-minute journey, I negotiated the one way system through the town to be able to cycle to the camp site. I was the first to set up my tent up in the dry. Others arrived while I went to Tesco to pick up provisions using the track that goes through woods to Loughborough. In the evening I joined the CTC Milton Keynes cyclists on a ride out to Rothley Fish and Chip Restaurant. They had done 82 miles that day. On Saturday I went on the fifty-mile ride. Just before we left the rain came down and was with us all day. In the evening we enjoyed a slide show on rides around the country from Ian, a CTC Nottingham rider. Sunday also started of wet but by 10.00 a.m. it had stopped and we had sunshine all day. 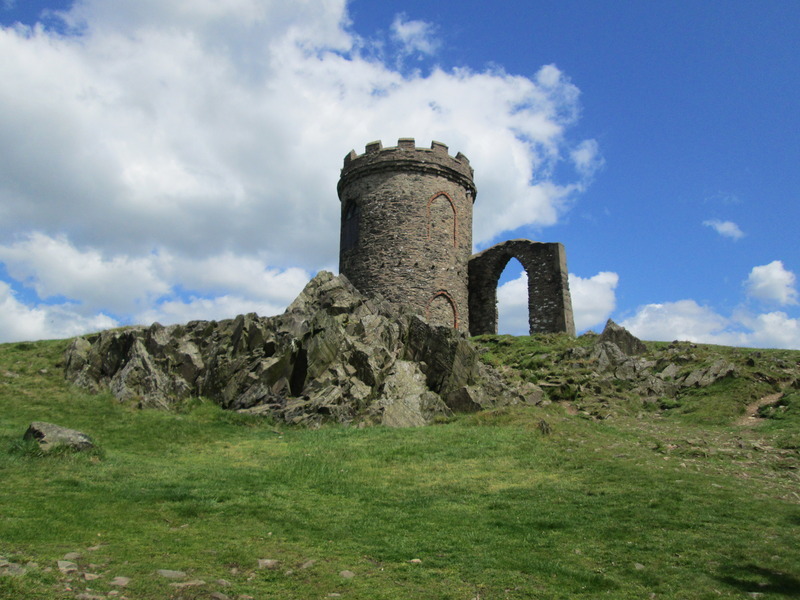 I went to Bradgate Park and saw the deer and the ruins of Bradgate House and then pushed my bike up a hill to Old John Tower, which looked nice and gave a good view of the area. I returned to the campsite and walked around Beamanor taking pictures. Beaumanor Hall looking imposing. The campsite is in the beautiful grounds. Later on we gathered to watch three short films “Jour de Fete”, “A Ride across Cheshire” and “A Day Out”. On Monday I cycled back to Northampton passing the train on the Brampton Valley Way, just setting off with a plume of smoke from its chimney. It rained solidly all Saturday morning and the forecast was grim. However, it often happens that there is a break in the rain before the next rain front arrives. 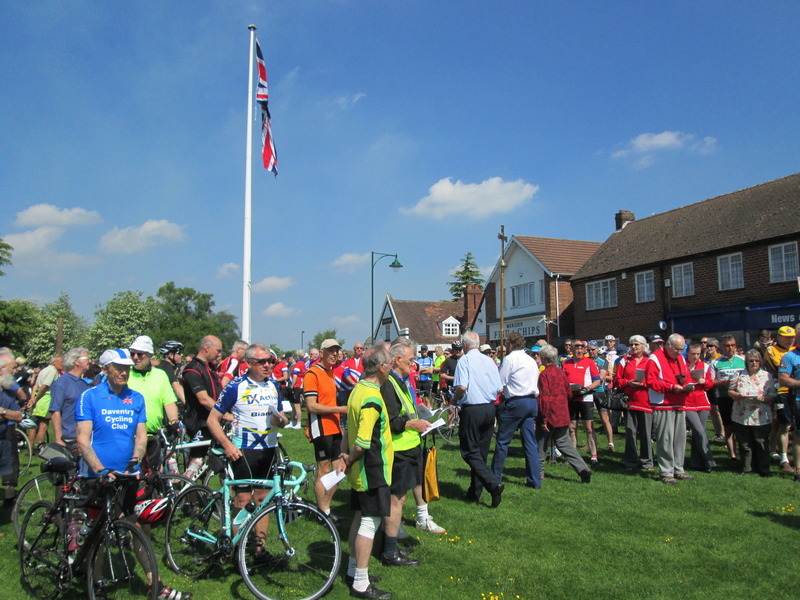 This was true to form and at 1.00 p.m. there was a break in the clouds and by 2.00 p.m. when three riders met at East Hunsbury the sun was about to break through. Iain D was on his Brompton folder, being a leisure ride, but he seemed to be rocket powered as we sped along Banbury Lane. We never quite found out what he had in the large bag on the front of the bike! Given that we were three regular riders we adopted Plan B which was to extend the route to Weedon and try the cafe next to Joyride Cycles on the A45. The café turned out to be closed but we enjoyed a quick visit to the bike shop and a chat with Natalie who we met recently at the cycle day in the Northampton Museum and Art Gallery. Back to Plan A and we set off to the The Paddocks tea-room in Flore where we received a warm welcome and very good coffee and cake. After the morning rain the air was very clear and we had great views over the countryside as we made our way from Flore across to the Nobottle road and then back into town. Riding from Sixfields down to the canal, the approaching dark clouds looked distinctly ominous. We split up at Hunsbury and Milton and I set off on the cycle tracks across town only to be caught by hailstones about a mile from home. Despite this it was a very pleasant afternoon ride and thanks to Iain D for leading the route. For those of you not venturing out to Beaumanor for the weekend, we are laying on a leisurely ride to Flore this Saturday afternoon. We will be leaving East Hunsbury at 2.00 p.m. and heading out on estate roads and lanes over the M1 and through Bugbrooke and Nether Heyford before a tea-and-loo stop at the halfway point: the nursery in Flore. The return trip will take us back across the eastern side of the M1 and through Nobottle, the Berry Wood estate (never been through there so that could be interesting), the Upton Park estate and along cycle tracks in Northampton back to our start point. See you Saturday, 2.00 p.m., Overslade Close, East Hunsbury, NN4 0RZ. 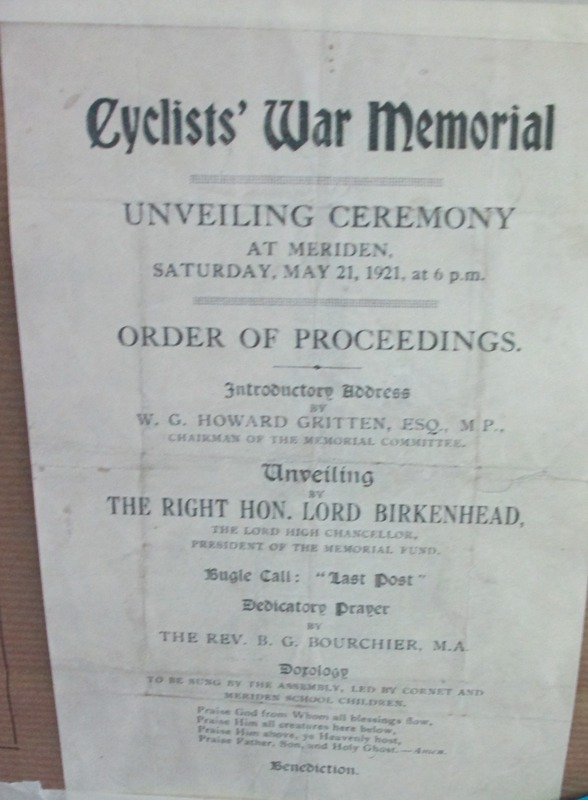 Every year the CTC Heart of England Rally and St Laurence Church, Meriden, commemorate the cyclists who gave their lives while serving their country in the two world wars at the National Cyclists’ Memorial in the centre of England. 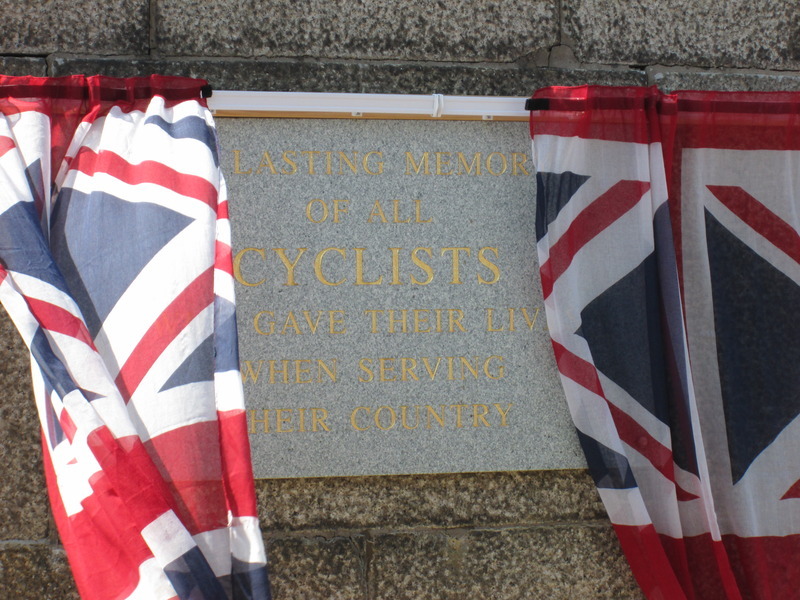 This year the service was blessed by the Bishop of Warwick and a new plaque was officially unveiled in honour of those cyclists who have perished in conflicts since 1945. Bill and I went by train from Northampton to Berkswell, where we met up with Iain on his large-framed fixie. The Service started at 11.00 a.m. which gave us just enough time to stop at a farm café on the edge of Meriden village. The place was full of cyclists including John D, George, Bob and Sue. After a short chat we set off together to the village green, arriving just as the memorial service commenced with a sermon by the Bishop. 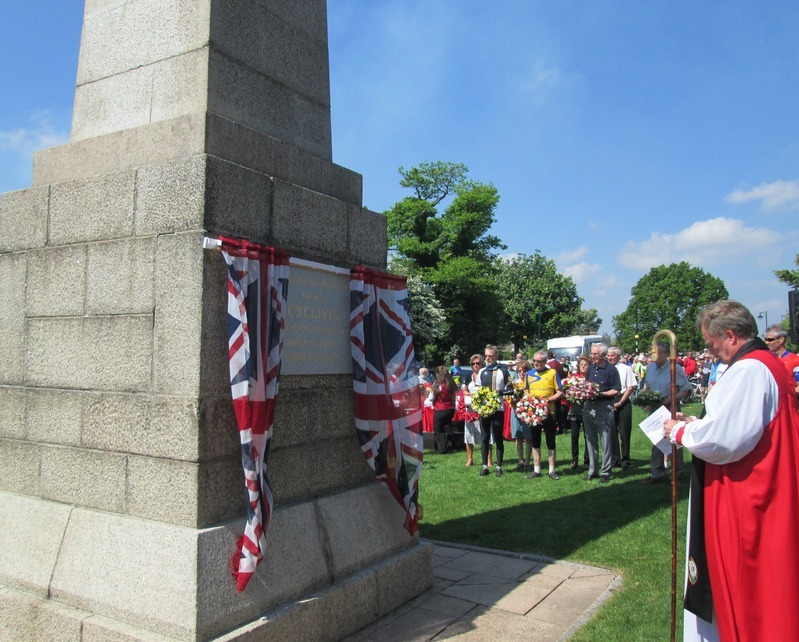 The service included the Bulkington Silver Band playing hymns, a talk, and the laying of wreaths at the memorial obelisk at the end. It was blessed with glorious sunshine. After the service we rushed down to the village hall to beat the queue of cyclists for tea and cake. 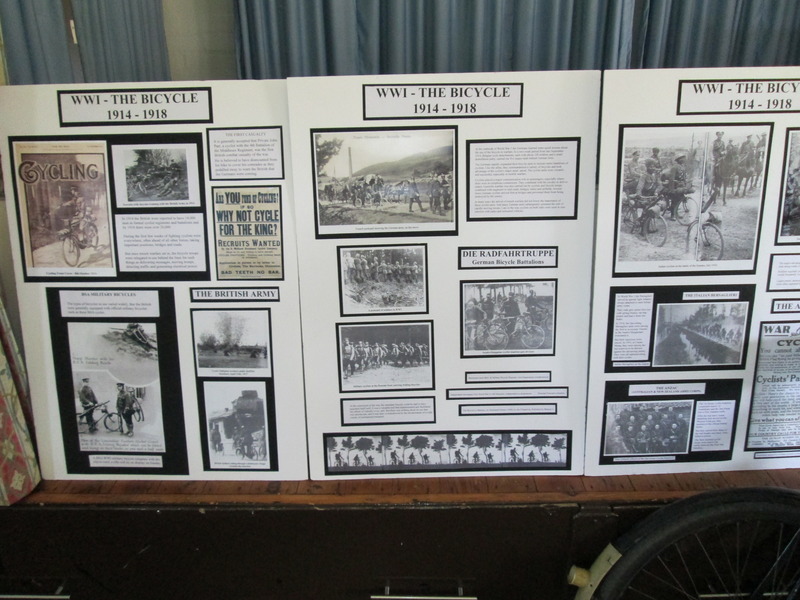 Inside the hall a brief history of Meriden Memorial was on display. Max and Richard were there but had missed the service due to an accident on the motorway. After refreshments Iain made his way back to Coventry, leaving Bill and I to catch the train to Rugby and cycle to Northampton. 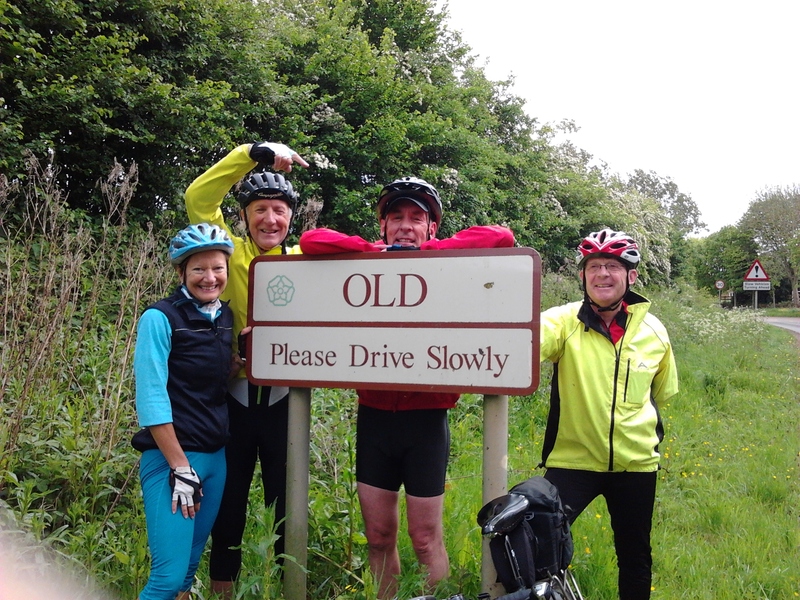 Five riders made the rendezvous point at the Windhover/BVW to enjoy the delights of this ride led by Alex (Alex, Miriam, Terry, Milton and Nick). Maybe it would have been more but the previous evening’s weather forecast was not particularly fair. As it turned out however the rain had cleared, the sun was out and the wind was blowing. A great day for drying your washing but an even better one for riding a bike! 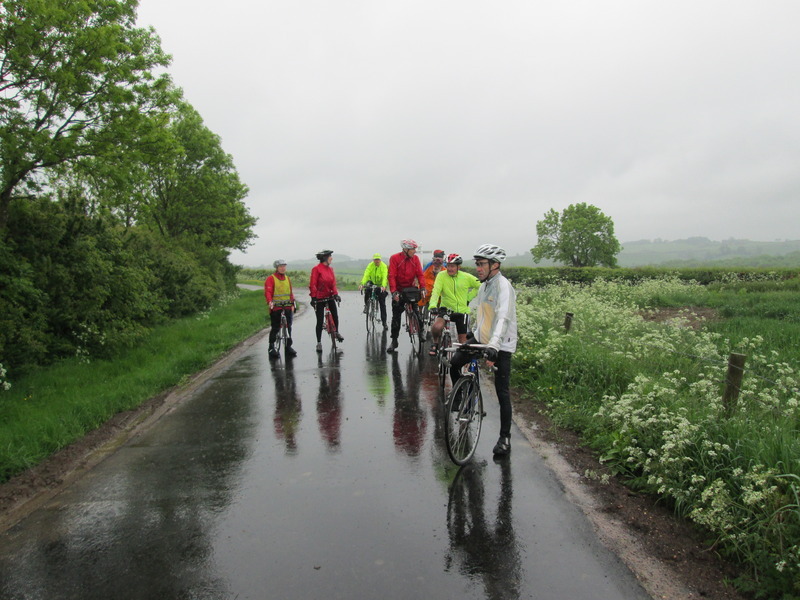 We set off in good spirits and headed north through Church Brampton before hitting the hills on the roller-coaster roads heading east from Holdenby through Spratton and up to Brixworth. Happily each of the hills was easily conquered with the large helping hand supplied by the not inconsiderate tail wind. 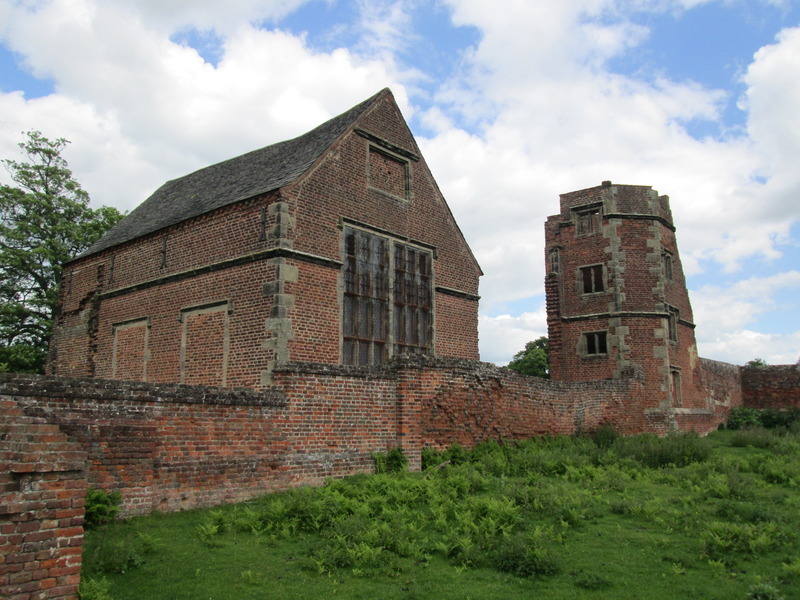 It was then north and north-east through the picturesque lanes linking Brixworth to Cottesbrooke and Haselbech. On the hill up to Haselbech we were reminded of the need for caution when riding near horses when an oncoming beast (with rider) was seriously spooked. Apparently it was something to do with the sight of Milton’s knees! Onwards to Naseby and then a seriously fast descent in the direction of Clipston (wind-assisted) but then turning south-east to Kelmarsh and Arthingworth. From here we climbed the Strava Queen of the Mountains section used in Wednesday’s Stage One of the 2014 Women’s Tour of Britain. At the top, outside the Tollemache Arms pub, we paused for a breather. It was at this point that we realised that we had actually ridden three of the four Queen of the Mountain stages used on Stages One and Two of the Women’s Tour. A little bit of messing about with a smart phone and we were ecstatic to discover that all five of us had ridden two of the sections faster than the professional riders on Wednesday and Thursday had. FANTASTIC – however, just for the record we did it in the opposite direction …..
Not long after Arthingworth it was pay back time; we turned right and headed south and south-west across the flat land of the former aerodrome at Harrington which put us right into the teeth of the gale!!! Alex was the leader so we all hid behind him. We took a hilly detour off this road through Draughton – its a strange day when you prefer including a hill to avoid the flat – but it did cheat the wind. Through the villages of Old, Walgrave, Hannington and Holcot before closing on the destination of Moulton. Terry and Milton peeled off for home whilst those left enjoyed a coffee at the J-Gallery in Moulton before wending our way home. Grateful thanks to Alex for leading this ride. It lived up to its name and happily, despite the often ominous clouds scudding along, we did not get rained upon. The route is here on Garmin Connect. 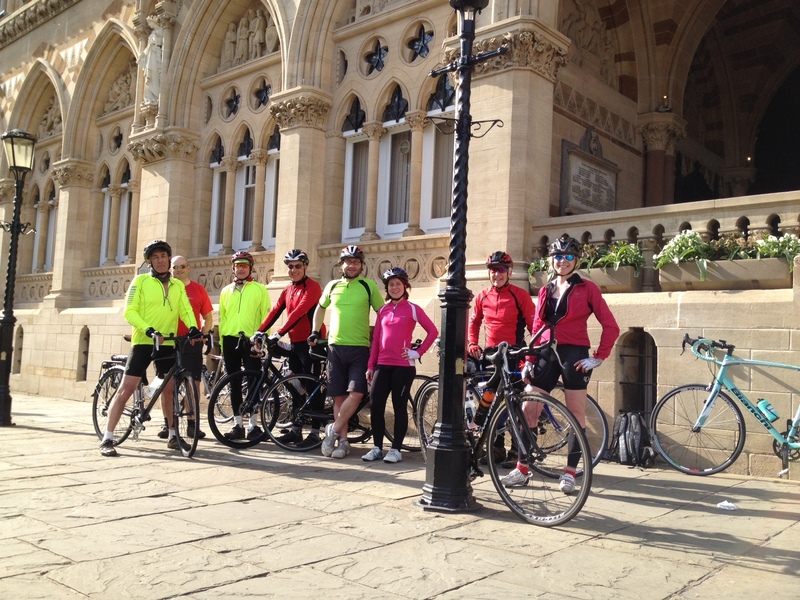 It is not often that we get a chance to do a linear ride without returning to the start but last Sunday week, twenty riders met on the Market Square in the centre of Oundle at 9.30 a.m. to ride the route of Stage 1 of The Women’s 2014 Tour: 100 km finishing at the Guildhall in Northampton. 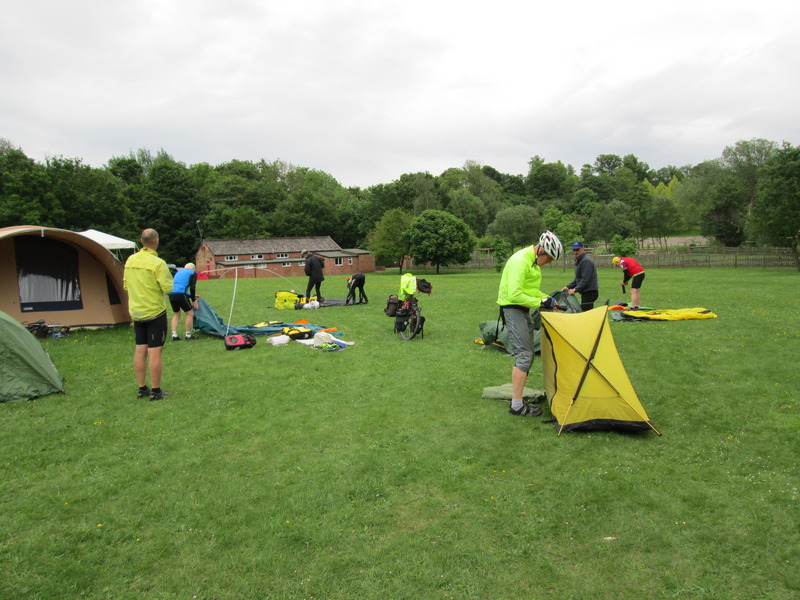 Six of us took advantage of Iain D’s landrover and a borrowed trailer to get to the start; some went by car with a lift back to the start with ride leader Ian M; three others cycled out from Northampton; and, to complete the group, four riders associated with Oundle School joined us. With the emphasis on the reason for the ride, the mandatory photo at the start featured the ladies at the front. As a large group, a quick briefing from ride leader Ian outlined the grouping for the ride. As it turned out, riders were all experienced and of similar ability so we kept in small groups within sight of the leader regrouping from time to time. Apart from crossing a few main roads the route was quiet and traffic-free, through some very pleasant countryside. It was sunny, warm and with only a light wind, ideal for riding. Unusuallly for a CTC ride there were no cafés along the first part of the route (not that the ‘Tour’ race organisers would be planning for that) so a brief respite at Rushton gave us time for socialising as well as preparation for the quoted “queen of the hills” at Harrington. This hill was not so much steep as relatively long and sustained. We were all ready for a lunch stop in Brixworth. Although we arrived at about 12.45 p.m. ‘Sunday lunch’ in the pub took some time for a large group and we did not depart Brixworth until 2.45 p.m. somewhat behind schedule but having had a very sociable break. As arranged a number of riders left the group at this stage to return home and a reduced group continued for the second half of the ride. 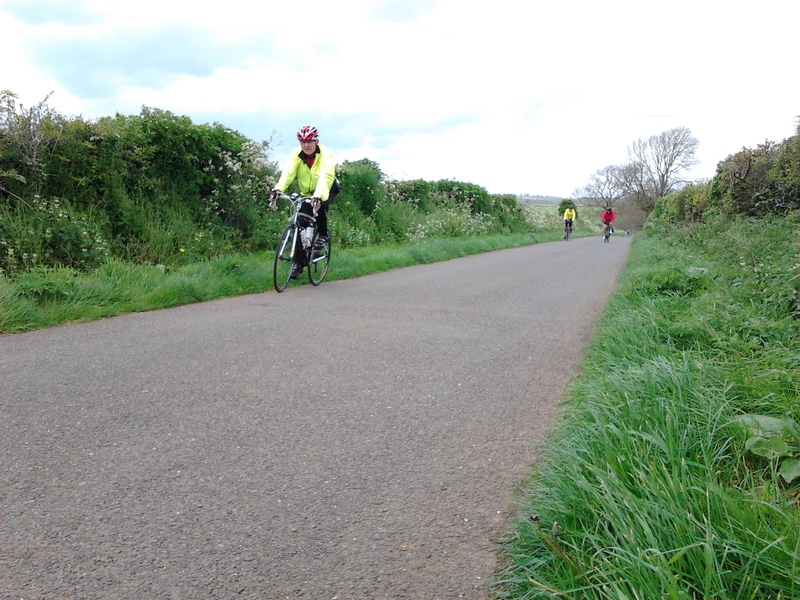 This took in some of the steepest hills on the course especially between Brixworth and Great Brington. We could not go through the closed section of the Tour route through Althorp but thanks to Ian’s recce earlier in the week, our detour followed the official route as close as possible. From Nobottle it was a relatively fast run on a straight road to the outskirts of Duston, where it seemed as if we were nearly home. 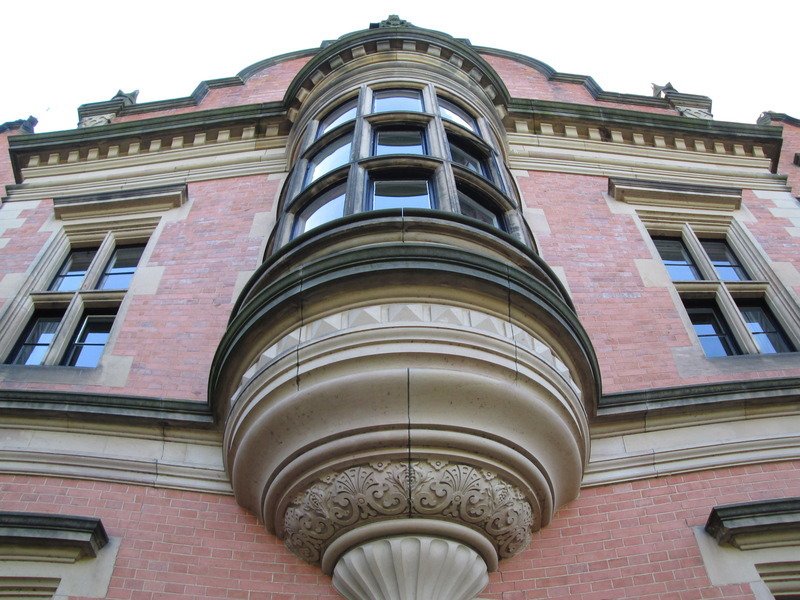 However, the route turned south around Northampton taking us as far east as Great Houghton before it returned along Bedford Road and into the Derngate for a sprint finish – won, of course, by Emily and Chloe. There was a celebratory photo outside the Guildhall. The race organisers certainly chose a great route through the County with some of the best cycling on quiet roads. I wonder what the Tour riders will make of some of the road surfaces en route. Many thanks to Ian M for sorting out the route and leading so ably on the day. Just for the record the route was 58miles (93km), total ascent 3048 ft (938m), 37%up, 33% down, 30%level (<1%). Average speed 13+ mph. 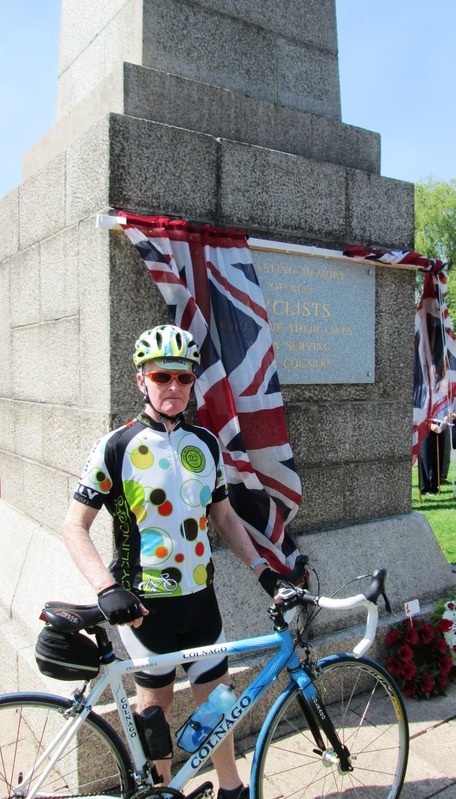 “Ride The Route” – Sunday 4th May – Update! I did a second recce of (part of) the route today. I had a second look at one part; and I went in to The George at Brixworth to speak to the staff there about lunch. I’m clear about the route from Geddington to Rushton. Of the two minor roads west out of Geddington we’ll take the one which goes past the Dovecot tea-room at Newton. Almost immediately upon passing the tea-room, it has the newest, smoothest tarmac of any minor road in the county! This emerges at a new large roundabout on the A6003 where we’ll go right (north) for two hundred metres on the dual carriageway before turning left (west) on the minor road to Rushton. I also called in at The George at Brixworth. “Hello Sir! You taught me history in Year 9!” said a splendid barmaid. I’ve confirmed the booking as fifteen for lunch. We’ll have a pleasant room set out with tables for four. Zoe confirmed again that they are happy to serve the children’s portions of the roast dinner menu (at £4.95) if you’re not up for the full portions (at £8.95). Thinking about the route after lunch, I’m going to stick to the route here on RideWithGPS – avoiding the A5199 and A428. I’m grateful to John C for a helpful e-mail which, among many points, advised that the A5199 would be safe for a large group going south. But our diversion also avoids parts of the “Spires & Squires” sportive route. If the sportive riders are still out in the afternoon, we’ll meet them between Great and Little Brington where they’ll be going in the opposite direction. I think we will be a group of twenty riders at the start. Marianne’s group will start and return to Oundle in a loop. They may turn back before Brixworth and so that’s why there’s a smaller number booked for lunch. 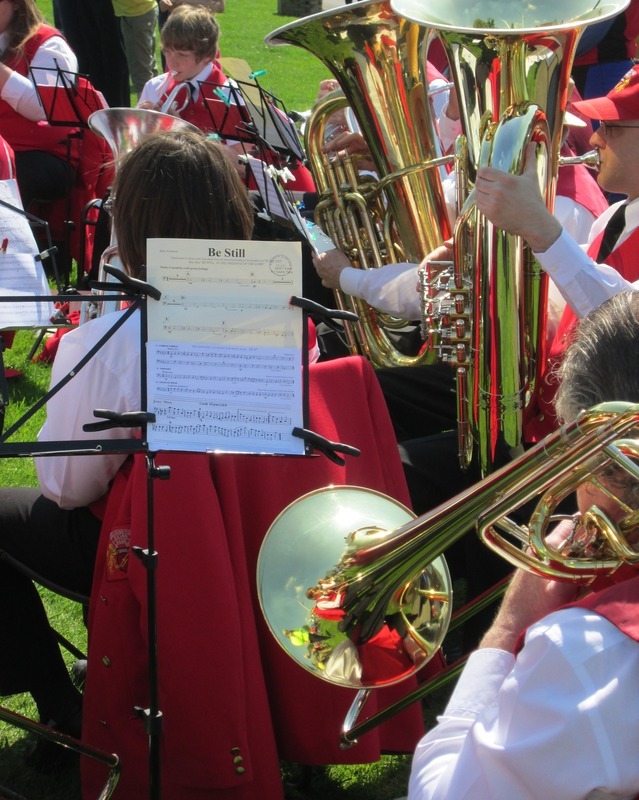 Join us in Brixworth! We’ll be at The George from 12.30 p.m. to 1.30 p.m and then you could cycle with us in the afternoon. You don’t even have to go all the way of the route – you could jump back to the town centre from Nobottle or Hunsbury! Thanks to everyone! Really looking forward to this!